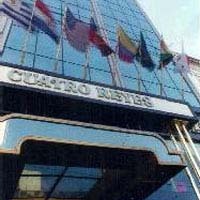 The new Cuatro Reyes Hotel is placed in a modern seven floor building, having 71 comfortable bedrooms, 6 of which are bedrooms with Hydro massage. The facilities stated below plus the special service provided by our bilingual staff will make your stay much more enjoyable. Cancellation is possible until any time of day 4 days prior to the check-in date with a penalty of 1 night's stay.